Talos always drops 6 Treasure Cache Keys, remains, 1 vial, 1 random scroll, and 2 items. * Talos' Power Crystal: This item is no longer sold on the Earth Elements store. It has been replaced by the small glowing statue of Agne. 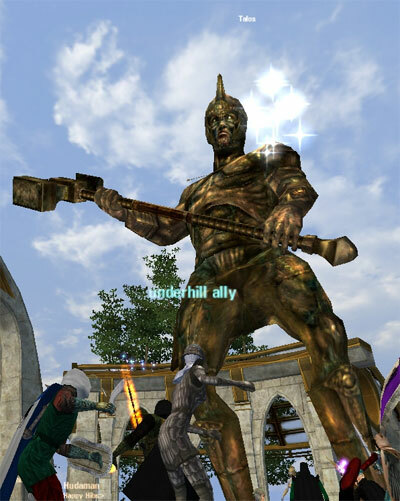 In case this didn't alert you, the Talos (ML8.10) encounter has now been reset to the old method of having to do the Agne's statue army fight prior to tackling Talos himself. Yet another Mythic anti-farmer device now they've once again made farming ML mobs useful and productive. Take your battlegroup to Agne's Battlefield (approx 35k 35k in Arbor Glen). Position everyone at the top of the steps and then hand the small glowing statue of Agne that you purchased to the Agne's Constructor at the back of the ramp. He will slowly walk forward and summon Agne and the army. You will have to fight 3 armies, each consisting of Agne and a wave of statues. The walk from around the sides and form up at the bottom of the steps, just out of aggro range. The first wave will con yellow to 50's, second orange and third are grapes. The best tactic is to pull the Sages and Mages at the ends of the line with single target range spells/arrows and kill them first. The fighter types can then be easily dealt with. Agne will be unkillable until all the 3rd wave is wiped out. I would recommend setting /bg loot treasurer for this encounter. Agne drops 3 types of keys. You need to visit the treasury at the back of the building. I forget the names of the keys, but a couple of types are multiple drops and give random items from the chests and the other gives the Talos Power Crystal which is the item needed to activate Talos himself. Without this key, you can't get the crystal, and without the crystal your encounter fails now. If you don't set bg loot, you'll find the key drops to the one person who decided the fight would be a good time to go afk..
Now that Agne has been defeated take your battlegroup East to the Temple of Talos and the encounter proceeds as normal. Drop the crystal on the head in the centre to activate Talos. Watch one of the most impressive pieces of coding in the game as Talos comes 'alive', this is especially impressive at night time when the glowy effects are most noticable. Then its a straight zerg on Talos. If possible try to fight him at the front of the Temple out of range of his 2 healing statues at the back. He has more hit points than he used to have, but no 'new' tactics unlike some of the other MLx.10 encounters.